Writing afterwards is always a navigation of so many returning layers I normally take for granted. Visual field pulsates, shimmers, adjusting to external input. Words give form to the brain, like my own name. Float ends with me thanking the water- thank you for holding me like I know I am held. After this morning’s session that brought up so much I tried to swallow about my car accident 8 years ago, it came up in a safer way in the tank, the 7 or 8-second flashback that looped thousands of times a day for months, hundreds for a year or more. In the darkness I allowed myself to remember something I had pushed down- that we hadn’t just spun in the car, but we had actually been airborne, without orientation, in chaos, for a good second or two, or eternity, as we flipped and made our way to land upside-down with the tail of the car barely making the fence, which prevented us from being crushed inside. My first real encounter with the imminent likelihood of death and its ultimate inevitability. I stared into it, while spinning. Stretch, open, find my way through the incredible tension in my hip and shoulders. I don’t need to be angry about it anymore. It’s a practice not to feel disappointed when gravity, pain and pressure return to my hip- but it’s just a sensation. I wrote nearly this exact same thing in my first float- so there’s something; being ok/at home even with no change/relief. Filming next week. Themes are clear: evolution, setting down burdens/layers, natural movement, pulling the center of peace out into the storm of the world. Lenses of reality, flow stopping w/ staccato hit, flowing again. Shots- curling hand, closeups of water, edges. Only occurs to me at the very end of the float to extend the metaphor of being in the womb (amniotic movement, sound through mama’s skin and placenta) to the transition and what comes afterwards- readying myself to open the hatch after the music played for a full song (very deep to have it be the music of my choosing), it hits me that I am choosing this moment to be born- it is a choice. So how to move into the world after birth, emerging from the deep soft warm space of mother, so fused with/diffused into source? Not into fluorescent lights and forceps, that’s for sure. Not through a cut (if by choice). I keep the lights off, except for a small amber one, step into the warm shower for a good long time, cover my face in nourishing oil. What tools can we use to stay connected to the un-dream of source? At first this means nestling into Mom, skin-to-skin, breastfeeding then, as life picks us up to find ways every day to meet with deep restfulness and surrender. The body needs this resetting in order to continue. Otherwise it’s too much, if you can’t peel off what the day asked you to hold and bear. Early float was restless- allowed myself to move stretch, open the joints, feel into the sore feet, weak ankle, congested pain of the hip. Find ways and more ways to soften what has become my neutral, but which is, in reality, an intense holding-on. When I stretch my arms over my head, expecting to meet the wall, but touch nothing, reality slips into a new focus like a lens during an eye exam. All the identities I’ve tried on over the years flip into place over me like more lenses, or pages of a flipbook. Same when I press my thumbs into my wax earplugs and suddenly reach a stronger silence- light starts swimming through my channels like brilliant eels in a labyrinthine waterway. Somewhere near the end, my head gently bumped into the end of the tank- a small blue spark flashed up and then subsided. I thought- oh, that’s the soft spot of my cranium where the plates haven’t closed up yet. Like a baby (or a monk meditating for a lifetime). The other day someone reminded me to befriend the 5-year-old girl in me who first began to test out the world after learning what elemental survival techniques she could from the love of her parents. She is doing such a good job, keeping me safe. With the final music, I revel a little in swimming through the water, really dancing. How would you celebrate your last moments before birth or afterlife? Now as I write, I look out the big window into the damp night and see a drunk man with dreads toss whatever bits of plastic packaging were in his pocket out onto the street. And that is just the simplest seed of what needs to be held by the great mother. I’ve noticed that this blog, in a self-induced kind of way, has asked me to come out of the closet a bit about the extent to which I live my life through the lens of source, or spirit. Given that I’m organizing this project, I guess it’s a medicine I needed to give myself. Driving here I forget that it’s Friday night- sidewalks are full of barhoppers and partiers. And I choose instead to get into a tank with myself for a few hours and perhaps feel the effects of the eclipse slipping away. My intention? Feel ease within the rawness. Allow the void/myself to teach me about the potential of being comfortable with the unknowing. Writing seems to ask a codification of my brain that is alien, unused for the past stretch of time. I don’t know if taking 3 droppersful of Bee Calm tincture right before floating is cheating or not, but it sure helped me loosen myself. I can barely hold the pen. Whole body slipped laterally across a dimension, testing the permeability of perception. People talking in the lobby seem too harsh to me, too bright. I get self-righteous inside- why blabber about this experience when you could sit with it afterwards and feel it continue to unfold within you? There are many ways- have to remember what is mine is not automatically the best. That’s an embarrassing thing to write. Ah well. Deep diffusion at my edges. The stress and emotional exhaustion is further away. Body has experienced putting something down. I move to my car to find some semblance of a bubble to write in. The eternal challenge- to be rooted enough in the excavated peace to be unfazed by nothing- loud voices being part of the easiest tier of testing. Water chooses when to lift me up, like the moment of liftoff in a plane. There’s no choosing to defy the buoyancy when it chooses to take you. Shift in brain waves tonight towards something that defied descriptive/verbal anchors. Curled up fetal- permission to be in the womb. Spun my orientation the other direction in the tank and felt the shifted compass freeing some calcification of my inner perspective. Fine line between orientation and judgment- thinking you know where you are and what is what leads to all sorts of hubris. returning repeatedly to the elemental/infinite origins of movement- from that space could emerge an explosion of forms, or the subtle shifts of the amniotic dance. No matter the collective outcome of this project, I will be grateful for the repeated opportunity to practice relinquishing all the trappings of my life and see what still shimmers pink and healthy beneath the dark surface. In the middle of the float, a sharp clue- climbing back into the tank after a brief rinsing off, I half-shut my thumb in the door. Pain erupts, comes in waves. Cold water sharpens it. I lay back in the saltwater, accepting this as the new, unavoidable parameter of my experience. Water holds me, a container around the throbbing pain. Somehow it lessens- who knows how much time it takes. I’m disintegrating into the water, trying to accomplish nothing. A greater gift than any active choreography coming out of all this would be a clearer knowing of who the mover is, or what is pouring life into the movement. The most restless float yet. My body did not want to let go. I moved and moved, stretched, adjusted. Breathed in through each energy center from root upwards, took many tries to get up past the heart. When I finally got to the pineal gland, reality started shifting and unfolding. An upside-down rose-like carnation, pale purple, bloomed as though the sun was beneath it. Very crisp. Lower back wanted touch, release, spaciousness. Swimming through the water felt easeful, but stopping could not find its place of ease. Tight belly, systems not as clear and open as I have been experiencing. I went in on the buzz of Michael Meade’s talk from earlier in the evening, with the intention in mind, “be the sea.” Allow myself that unfocused space without pressure of a choice, so that the hand of divinity could pluck me out and place me back in its mouth [context: from the story of the man being plucked out of the sea of consciousness by Vishnu and tossed back into the dream world inside his mouth). But that desire to be plucked out of the morass of ambiguity is itself an expectation- how do we go on if we don’t know we will be plucked out from the place of not knowing where to swim? Time disappeared over and over in this one. The veil of the brain is thin and clear- one can open its membranes at will, porous to a new experience. Relaxing what feels like innermost fascia allows the oscillating visions to seep through immediately, before the thinking mind wrenches back control of the imposed structure of the experience. I went in asking to be shown the dance I already have within me. It is a simple dance, one of birth, of reenacting evolution, and the very building blocks of movement- how a baby naturally would learn to stand (accelerated) if placed on their back. But standing itself is too complex, or superfluous for now. The body becomes vast. Curling into myself, it seems an interminable distance before my elbow touches my knees. I feel the micro adjustments of deep muscles as I curl and let go, exploring flexion like a new mermaid understanding her place in the sea of things. The urge to narrate my experience while I’m in it is intense. The judge, the separator. The director. The one who sees- how to see without being separate? Expand the vantage point. There are infinite ways the body can relax into an experience of source. I feel I am finally coming into a true experience of myself, if such a thing is possible. Releasing the grip of old judgment, thick layers painted over the tool of the body, the natural tool. There’s nothing to judge, it’s what we’re given. Lately as I am conscious of letting go, I feel more and more the fluid in my body, and I thank the flow of the water for sustaining me and changing me. Of course we’re not separate from the wet earth body of the mother. 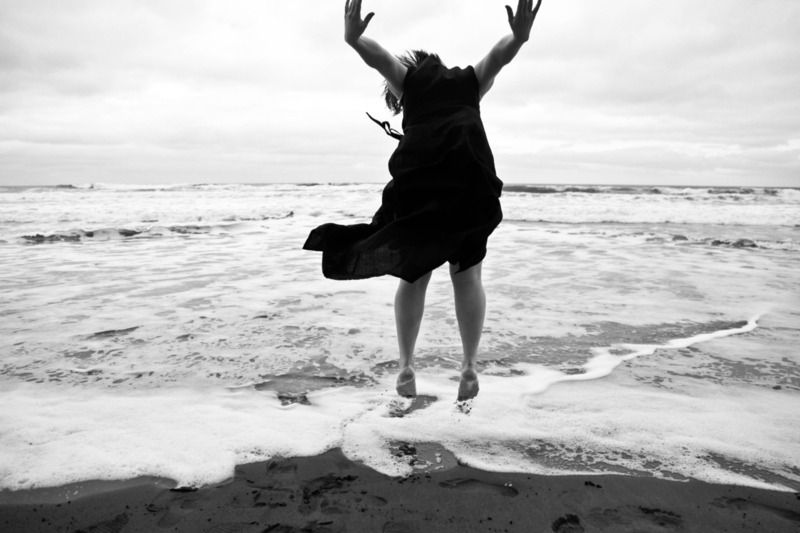 My dance wants to be in water, following the desires of the body, barely slipping over into visual manifestation. Perhaps splicing over into a standing dance, translating the fluid silence into the mess of the world. Shot at… an intersection of overpasses? Circling me with a wide angle lens? Or under the bridge on the Springwater Corridor. I open up to the possibility- the actuality- of my vision becoming enacted. Something in there about my car accident. Before rising, after dancing freedly with the ending music, I prayed and gave thanks to the void and the great mysterious creator. Eyes closed, the blue light shimmered a new existence, but a black hole center remained. I know I will experience pain again- even in this moment. But I am grateful for this opportunity to recognize, release, and relieve my suffering- and thereby, in some fashion, the suffering of all sentient beings. Today at the Dalai Lama’s talk, a beautiful Tibetan man in colorful robes sang spirit in front of us- and then asked us to sing Om Mani Padme Hum with him, over and over as people continued to file in and HH’s presence became more and more felt in its glowing radiance from backstage. 4,000 of us sang together, from robed lamas to my left in saffron and gold to the drab blue-grey cloth of the nuns and the western hybrid costumes throughout. We generated a kind of collective hum, in sync, so gentle- I imagine the venue glowing a bit from the outside, radiating something into the city beyond. A drum line led by a chief elder followed, and HH slipped onstage while they continue in fierce concentration their wailing. He walked slowly behind them with a look of glee on his face that they did not notice. At the end of the line he stepped forward and mimicked the rhythm of their swinging hands, then sat down in his low chair behind them, equipped with his purple visor to shield the light. The physical pain returns to my hip soon after I reintroduce gravity to my body, but I don’t give it too much energy. I am whole. Tonight’s session was by far the most restful of any of my floats. Deeply, profoundly restful. I feel like my cells put something down. I nodded off to sleep a few times and woke myself with a kick into the water. Almost no imagery, and none of the feeling of accelerating into an altered state in that panicked sort of way. Just deep stillness. Very slight play with that notion of the body’s natural organization, the balanced posture it gravitates to on its own, from the whole being down to micro-relaxations of the neck. And then- how does the mind want to shape itself? What is the natural, relaxed posture of consciousness when left to its own devices? Deeply soothed by the waters, especially verging on my moon. Feels like the deep waves of the yellow pond lily continue to wash over me. What a space I’ve moved into- I should count the plant teachers I’ve worked with today… PMS emotional tincture, the nettle tincture I made, palo santo and sweet orange essential oils, then skunk cabbage, horsetail, yellow pond lily and highbush cranberry in circle, then Capetown rooibos tea and now harmony tea. Not to mention the coconut, almond, spirulina, maca, cinnamon, sea salt, arugula, buckwheat, lentil, maple, yam, lime and cilantro gifts I’ve received today. So thankful for the spirits of plants and the waters that run through us all. How does the body want to move? How does the voice want to speak? How can we let go and let go and let go so we are out of our own way more and more? What would it feel like to be the most purified version of myself, without getting OCD about it? The willingness to choose to relax into it, and to choose again, and again. To rest in that place of unknowing for even a moment feels brave, feels real, feels necessary.